This 6"W x 2"H "Closed" sign comes with 12" brass jack chain and 'S' hooks for easy use. Simply hang over valve handle for maximum visibility and instant recognition of closed valves. 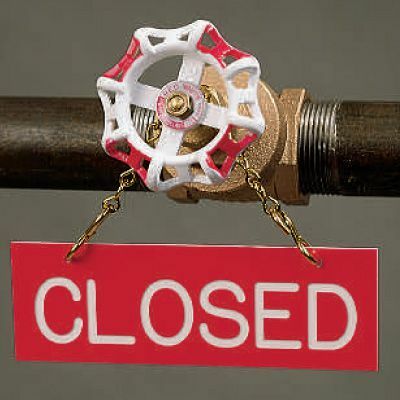 Red valve status sign features white letters for easy readability. Valve sign legend reads "Closed"
Complementary Open Valve Sprinkler Sign is available. Need pipe markers along with your valve tags and signs? Click here to browse using our Pipe Marker Wizard.